March has been an unusual month for me, with travel and computer and technical issues taking most of my time. Although I feel a bit like the baby above (Wah! ), I did not want this month to pass without writing something about the women involved in Georgia photography, or at least give a nod to those I have thus far identified. My database now holds records on over 185 women throughout the state who were involved in the business of photography from 1849 to 1950. Many of the women I’ve documented often wore one or more hats – as photographers, colorists and/or retouchers, studio assistants or gallery receptionists, printers, managers of photo stock sales businesses, and more. The earliest woman I’ve noted is Eliza H. Blanchard, a miniaturist making daguerreotypes during March and April 1849, in Athens. Although I do not have documentation to back it up, I think that S. H. (Mrs. Adam) Libolt may have been in Athens hand-tinting her husband’s daguerreotypes when he was there in May 1843, as she did elsewhere for him on their travels in the southern states. I am not deliberately seeking documentation on women working in photography in the mid-20th century, but if an individual’s work years run into that period, I will certainly record it. 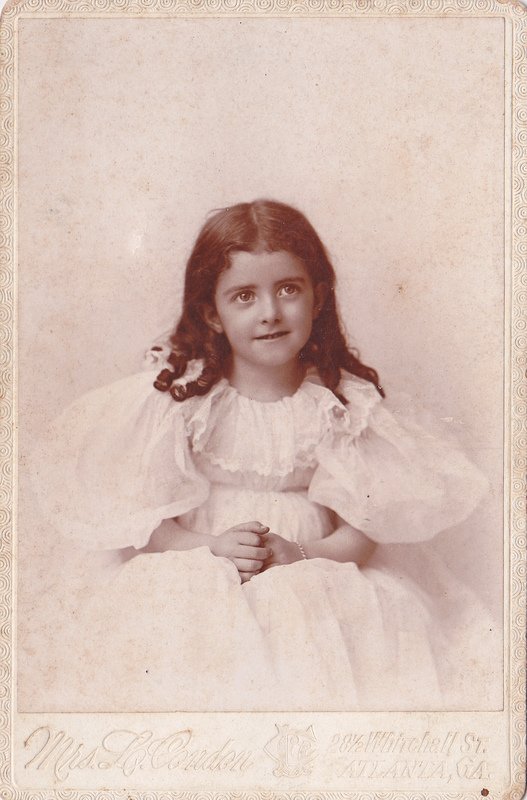 Ruth Ahearn (1893-1958) worked in Augusta beginning about 1920, when she was a “helper” in a photo studio. She became an assistant photographer, then a photographer in various Augusta studios and she continued working in photography until at least 1950. Some of the women I’ve documented were married to, or eventually married, the photographer with whom they worked, others were in business with their siblings, or a parent, or an in-law. A woman widowed, or an orphaned daughter, often continued and ran the husband or father’s photography business for at least a few years, and often for several years. I can tell you a few facts about the six African American women in photography I have been able to document working in Georgia. Lula Chisholm (b. 1886) was a printer and clerk for Atlanta photographer C. F. McDannel, in at least 1910, perhaps longer. She roomed in the home of photographer Paul Poole (1880-1955), whose wife Susie (b. 1896) I have identified as a photographer, although she was noted as one only in the 1935 Atlanta city directory. Minnie Mondul (1893-1971), wife of Atlanta photographer N. H. Mondul (b. 1886 Calcutta India; d. 1929-30) ran the photography studio after her husband’s death, until 1933. The Segee sisters in Savannah, Frances Alethia (b. ca. 1896) and Orita (or Arita, b. ca. 1899 ), called Hattie (Hettie), both worked for photographer John W. Johnston (b. Jamaica W. Indies, 1882; d. CA 1966) until 1920. They each took care of the Savannah business, at different times, while Johnston set up other businesses in South Carolina, or traveled. Frances began working for Johnston in late 1917, and Hattie in 1918. Frances married Johnston in 1919, and by 1923 the couple was in California where he continued working as a photographer. I do not know if Hattie continued working in photography in Savannah, so I have more research to do. Ruth Beatrice Hall (1900 – 1987) was teaching art and biology at Atlanta’s Washington High School from about 1927 until about 1932, about the same years she worked under the name Sisters’ Photo Studio, located on Ashby Street. By 1935 she was married to Virgil W. Hodges, and in the 1940s she began teaching art education at Morris Brown College. This is another of my Condon photographs, of Clark Howell’s daughter in another very dressy dress. I recently acquired another card photo made by Condon of a member of another prominent Atlanta family – Clifford Van Dyke Anderson in his military school uniform. I will save that image for another day’s post and discussion. Linnie Condon was known as the society photographer once she became established in Atlanta, but her early photographs give no indication this was to come. Two of the most interesting images I own were made by Miss Pickett, Annie Lizzie Pickett (1863-1949), of Americus. Before opening a photography studio in 1896, at thirty-three, she ran her own millinery shop, starting about 1887. She closed, or sold her photo studio before 1910, and although she was not quite out of her forties, she went into other businesses. 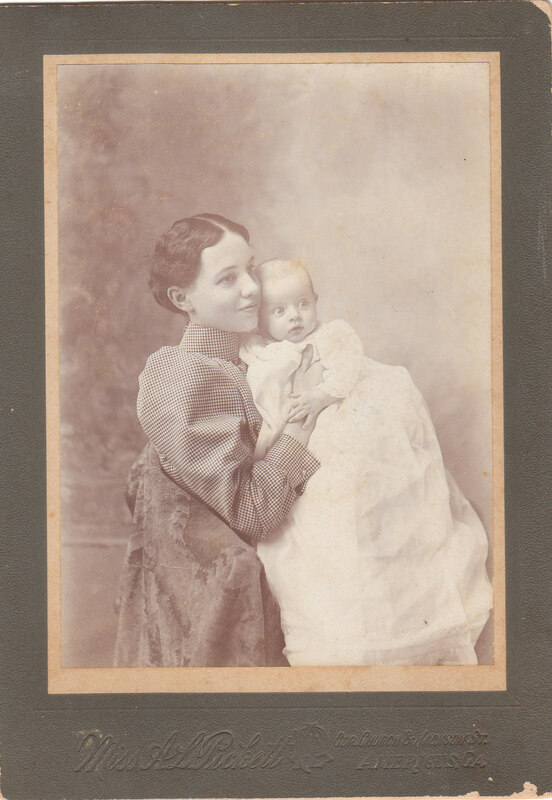 Here is another of her photographs, of a mother and child. I think these two photographs I have by Miss Pickett display more emotion than any other photographs in my collection. In closing, here is a quote from, and a link to Frances Benjamin Johnston’s article “What a Woman Can Do with a Camera” (Ladies Home Journal, September 1897). The woman who makes photography profitable must have, as to personal qualities, good common sense, unlimited patience to carry her though endless failures, equally unlimited tact, good taste, a quick eye, a talent for detail, and a genius for hard work. See this essay discussing Johnston’s article, her promotion of women in photography, and her other articles. I hope this short post encourages you to take a closer look at the women, particularly those in business (possibly photographers), you may come across as you go about your own Hunting and Gathering. © E. Lee Eltzroth and Hunting & Gathering, 2015. Unauthorized use and/or duplication of this material without written permission from this blog’s author is prohibited. The piece can be re-blogged, and excerpts and links may be used, provided that full and clear credit is given to E. Lee Eltzroth and Hunting & Gathering, with appropriate and specific direction to the original content. Hello, I was so happy to find your posts. Annie Pickett was my GGAunt and we have a number of her photographs I could share if you were interested. 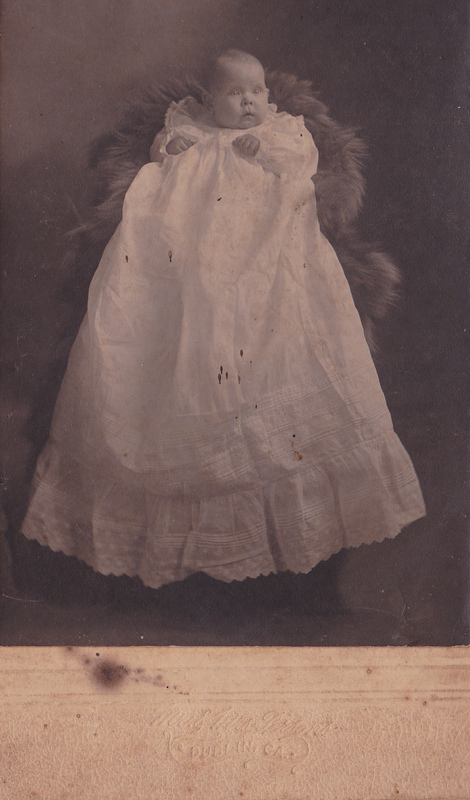 My grandmother posed for her as a child in some very unusual and charming candid photos (simple, from the back, etc.). I was trying to track some more of her work down when I found your posts. I believe Yale (?) University (or?) has some of Annie Pickett’s work in their collections as well and I am looking for that again. Thank you!! Thank you for commenting! It is so good to hear from relatives of GA photographers and Annie P is one of my favorites. Yes, I would love to see your photographs. Let’s “talk” offline.